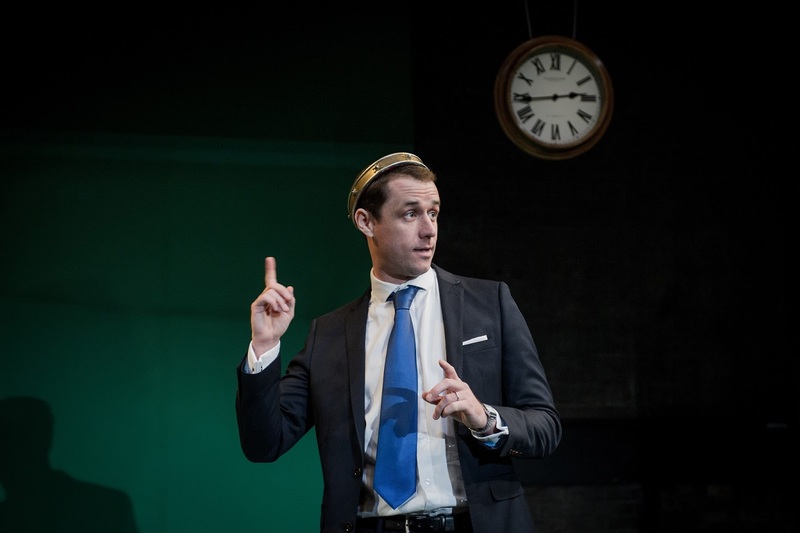 Following its recent performance at the Palace of Westminster, Jack Gamble and Quentin Beroud bring their Richard II to the Arcola Theatre for a short run. It has been often said that Richard II is the most “political” of Shakespeare's plays: the story of a King too held back by the past, the last Medieval Sovereign killed more by historical change than by the man who reigned after him. Rightly, Jack Gamble and Quentin Beroud have decided to transport the story from the dark times of 1399 to a contemporary setting. This Richard II is less a King and more a Prime Minister dealing with his own political party, his enemies and the Press. The Press is the most prominent new presence of the performance, with breaking news, shown on three different screens, working as the underlining punctuation of the plot’s highlights. An omnipresent journalist played by a convincing Eleanor Cox, acts as a pushy commentary on what is happening behind closed doors and even the duels here are no longer a matter of bloody swordplay but rather a televised debate. In this modern dress take on the play, with actors surfing news on iPads, reading newspapers and using mobile phones, the language created by Shakespeare becomes a lively and vibrant interpretation of our modern day existence and the choice to retain it proves successful for most of the play. Occasionally however the words written for a King invested by God don’t sit well with a more modern character. This leads to a sense of detachment that prevents the audience from fully engaging with the show. Given that, Tim Delap’s Richard has a strong and powerful stage presence. His is an anxious leader capable of showing all his fragile humanity only at the end when, betrayed by his advisors and deposed, he is confined to prison. A man that is eventually deprived of his crown (and of his grey suit) finds himself able to see through the underhand plots. But it is Hermione Gulliford as Harri Bolingbroke who really shines in this production. Her fierce look, her controlled resolution depicts perfectly the leader for a new era. Her charisma in delivering Bolingbroke’s lines gives new, deep insights to the character. All in all a well-produced and acted production that, due to its contemporary and topical subject matter is recommended – especially for politicians!